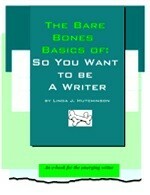 The Bare Bones Basics of: So You Want to be a Writer, by freelance writer and author Linda J. Hutchinson, was written for the emerging - or newbie - writer. Concise and practical information every beginning-to-intermediate writer needs to succeed, is broken down into easy to understand language. When you purchase this e-book, you will receive it via email in pdf format. You will also receive the Submission Tracker and the Don’t Lie to Yourself Time Tracker in Excel format. Please make copies of the Trackers to alter to fit your needs. If you don’t have Excel, download a fr*e alternative, Open Office, at the Links for Writers page at www.lindajhutchinson.com. AND, for a limited time, you’ll also receive a $10 gift certificate to Linda’s online store!